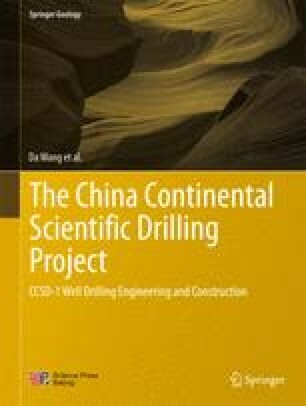 The casing program of CCSD-1 Well was different from that of conventional oil drilling and water well drilling in two aspects: not only were the standards of casing program different but also the moving casing techniques employed. In oil drilling, a casing program of 508.0 mm (20 in.) × 339.7 mm (133/8 in.) × 244.5 mm (95/8 in.) × 177.8 mm (7 in.) was generally employed, whereas in CCSD-1 Well a casing program of 339.7 mm (133/8 in.) × 273.0 mm (103/4 in) × 193.7 mm (75/8 in.) × 127.0 mm (5 in.) was adopted in design and in construction.